I get asked quite often about wardrobe staples and, while I certainly agree with the concept of casual basics, I also think it’s good to have some more sophisticated pieces in your closet too. 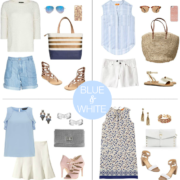 So, I decided to put together an outfit featuring some of what I consider to be must-have items for the summer months – below I’m sharing my thoughts on why, tips for how to wear them + budget-friendly styles to shop! Nothing says summer like feminine eyelet – this is a fabric that is timeless and there are so many different styles & silhouettes to choose from this time of year. Wear yours with jeans, heeled sandals & statement earrings for dinner out with friends or style with your favorite shorts & flat sandals for a casual day look. A few of my favorites: this bell sleeve blouse, this wrap top, this ruffled tank & this embroidered blouse. See more affordable eyelet tops in the scrolling bar below! It’s important to have a pair of dressier shorts in a crepe or silky fabric that you can wear during the day and dress up at night. These are great for pulling double-duty when you’re traveling too! I recommend looking for a mid-length that will be both versatile and practical & something that you can machine wash at home. If you have a smaller waist & curvy hips, you want to avoid anything with pleating, as it tends to be more difficult to get a perfect fit without the fabric puckering. Options to check out: these tie-waist shorts, this navy blue pair, these white paper-bag waist shorts & this gray belted style. I think everyone should have at least one “fun bag” – something with an interesting texture & bright color that can add a little pop to those summer neutrals. This isn’t your everyday bag, but something special that you can reach for when you need a little extra oomph to your look. Some styles that I’m loving right now include this net shopper, this textured crossbody, this raffia bag & this embroidered one.